No, Vasyl Lomachenko is not, as some are saying “already the greatest ever.” At least the scant evidence available doesn’t indicate as much. If Lomachenko is, in fact, the best in history, it will be some time before any of us find out, anyway. 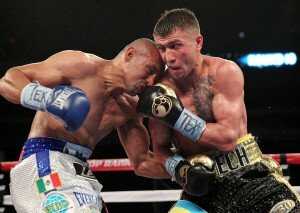 For Lomachenko is still basically somewhat new at his job as a professional prizefighter. Oh, he’s made his mark, both in the amateurs and in the pro set, but a great boxer generally needs great challenges in order to be recognized as a legend, much less be recognized as the best who ever lived. To date, Loma, as he’s called, has had one major pro challenge in the guise of rugged Orlando Salido. And Loma lost that one. While it’s true Salido played dirty before and during the match, a loss is still a loss. Besides, had Loma been more established as a pro fighter – it was only his second pro bout – he might have emerged the victor, regardless. After all, experienced fighters are more apt to know how to deal with the likes of Salido after a certain point in their development. The case of Salido, then, was nothing if not a case of biting off more than one could figuratively chew. An understandable mistake regarding the hype surrounding Loma, sure, but a mistake, nonetheless. Even if that’s all in the past, though, Loma still has a ways to go before knocking, say, Ray Robinson, off his perch as the widely regarded all time best (or even Roy Jones Junior, for that matter). What Loma is at this point in his career, almost four years after his first pro fight, is a very established professional. And a very good one. He’s not, however, a guaranteed Hall of Famer, at least not as a professional ring tactician. Far from it. What Loma is – what he truly is – is an insanely promising fighter. Perhaps the most promising in history. Keep in mind, though, that many insanely promising fighters have fallen short of expectations. Adrien Broner is, in fact, only the most recent example of this. To be fair, though, Loma is no Broner. This guys works hard. Incredibly hard. It even appears he views his craft like a mathematician views an equation. His training deals with both the physical as well as the cerebral aspects of the sport. That’s something worth noting. He’s also shown himself to be amazing in the ring. Just amazing. His angles. His footwork. His aggressiveness and finishing power. There’s a reason the 8-1 super featherweight titlist is so well regarded – because he deserves to be. Just don’t call him the greatest to ever lace up a pair of gloves. Not yet. At least let him get by the 25-2 Miguel Marriaga this weekend in Las Angeles first.